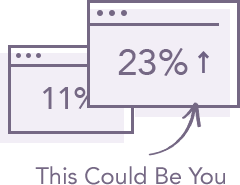 You’re one step closer to finding out where your website is leaking revenue via our free 30 minute consultation. I’d like to discuss how I can increase my website’s or app’s conversion rate. We are situated in the heart of Melbourne, in the digital hub of Cremorne. Converionry is a hub of conversion activity. We’re a team of multidisciplinary conversion specialists focussed purely on converting your website traffic into more sales and enquiries. Our team made up of analysts, data scientists, conversion copywriters and UX designers deliver combined insight through a cohesive process, by integrating complex data analytics and supervision of design and development. What does this mean for you? It is a seamless user experience with your customer’s needs at the forefront of every decision. Our only non-negotiable is to respect the CRO process. As it is an evidence-based strategic approach, we do not allow personal viewpoints to get in the way of the proven methodology. We deliver pure ROI and pure results. “Your contribution to the improvement of our website has been outstanding. The extensive testing on the website has really paid off and the sales prove this. We’ve earned their trust, now let us earn yours! Ready to Boost your Online Sales or Leads? Schedule your free website health check. Please fill out the form to the right, so we can organise your free website health check consultation, where we will show you potential revenue leaks and insights you can take action on straight away. One of our friendly Conversion specialists will contact you to setup your free consultation.